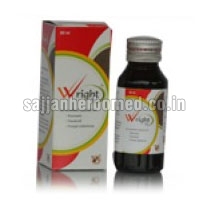 Wright Oil that we supply is used for providing relief from Psoriatic Lesion. Wright Oil is highly effective in treating scalp skin problems like dandruff, alopecia, lice etc., secondary hair loss, scabies, fungal infections, eczema of all types and ring worm infection. Wright Oil that we offer is prepared using high quality ingredients like narikela taila processed with wrightia tinctoria leave, and karanja oil. Our Wright Oil is very easy-to-use; gently apply on the affected area twice or thrice a day and massage the scalp for making it dandruff-free.